Here’s the profile for Sorachi Ace Hops. This variety got a lot of attention during the hops “crisis” of 2007-2008. Homebrewers were looking for high alpha hops and this variety was available. I started thinking about Sorachi Ace recently – wondering if its flavoring would have worked well in my Saison. The variety was named after the Sorachi Subprefecture in Hokkaidō, Japan. It was developed for Sapporo Breweries and used in their beers. The pedigree includes Brewer’s Gold and Saaz and has high yield potential. It was originally released in 1984 and was grown for a while in Japan and China. It was not available in the US until Darren Gamache of Virgil Gamache Farms picked it out of the USDA Hop Cultivar Collection in Corvallis, OR and started to grow it. Sorachi Ace became commercially available in 2006 and since then, has become a variety that has garnered a large amount of interest for use in intense American beer styles. Aroma/Flavor: Bold Lemon – all sources stated it’s lemon aroma and taste. Maybe a dill, cilantro, and coconut notes to it too. Slight background oak flavor. Typical Usage: Bittering, but with that focused lemon note – it would probably do well when used later or after the boil. Beer Styles: Probably any beer that would work with a lemon taste. Saison is one that comes to mind. Maybe an IPA with other hops that have citrusy tastes like grapefruit and orange. You have to be careful with this hop. It does have strong lemon elements, but it adds a really creamy, cloying, buttery element as well. Loser by Elysian is made using all sorachi, and was fondly called Diacytl Juice by some people who worked there because of the crazy buttery flavor it had in its first few batches. It is still a great hop, you just have to watch out for the greasy notes. If you are using it for the citrus notes, expect more of a lemon cream flavor instead of lemon. Also, the coolest part about this hop in my opinion is how late the bitterness hits your palate. It is really interesting, you get all of the flavors of the beer, and then completely after the fact that bitterness comes rushing in. Used it in a stout. Was great. in 5 gal 1oz for bittering, 1/2 oz ea flavor & aroma. It was not a big stout 1055 og ended at 1010 about. Light body, nice roast but hop flavor & aroma was nice balance of lemon/citrus. I called it a summer stout. I just got my first shipment of Sorachi Ace, and the description makes me think of American Wheat or Hefe recipes. Can’t wait to give it a try. I used 1 oz. 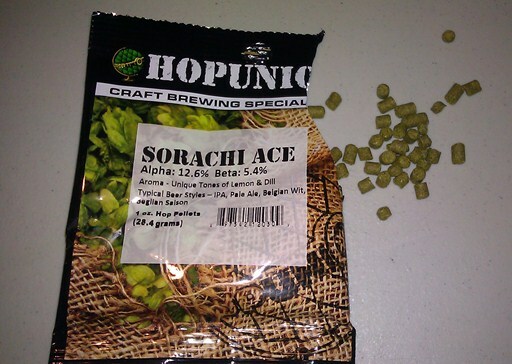 of Sorachi Ace in a IPA as a aroma hop along with 2 oz. of Simcoe for bittering and Citra for last addition and dry hopping. Scored 48/50..
Hey Art Cox – that sounds great. Congrats on the score! I used it in a Saison and was extremely happy with the characteristics it brought to the beer. Rather than mixing this with American hops, I might next time try to blend in some Styrian Goldings (orange marmalde, to me) for a saison. yes! I just used it throughout the boil, late and flame out, in my latest wheat beer, in fact I made it into a black wheat beer using carafe special3. with an addition of curacao bitter orange peel in late boil, I’m hoping for nice citrus notes in a refreshing, but black summer brew.